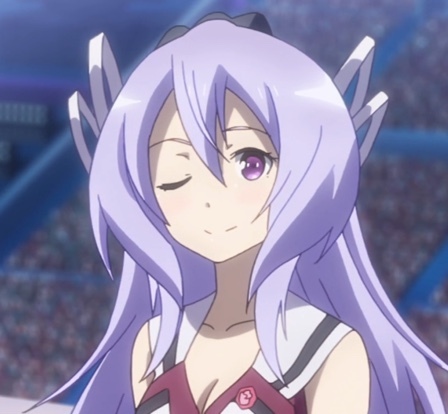 In Clinching Victory, the 21st episode of The Asterisk War, Amagiri Ayato and Julis Riessfeld complete their match against AR-D. We learn Toudou Kirin’s fate. Dirk Eberwein and Ernesta Kühne discuss opportunities for future collaboration. We learn a little more about the past of Yabuki Eishirou, Ayato’s mysterious friend. Finally, we see a shocking revelation about Ayato’s sister, Amagiri Haruka. Amazon has some interesting Asterisk War merchandise. Please check it out! 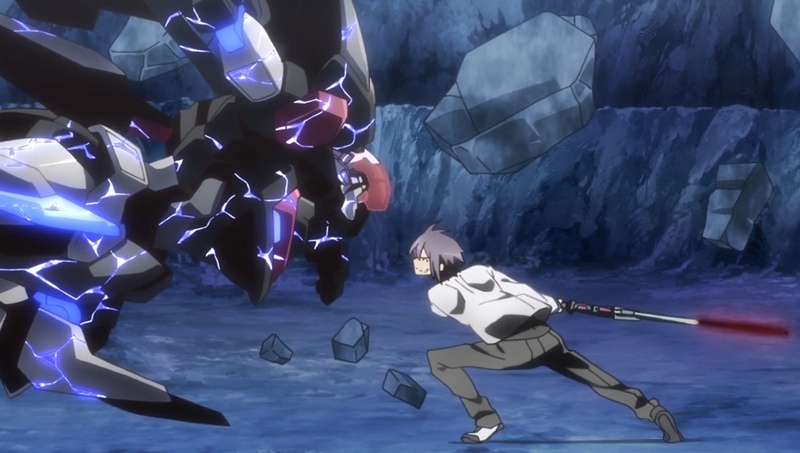 Ayato and the optimized Ser-Veresta go head to head with AR-D. Capture from the Crunchyroll stream. Ayato and Julis continue their slug-fest against AR-D, who grows more powerful by the moment. They’re able to push him so hard he releases release so much power that he injures himself. They use the time to come up with a counter attack. Julis is wounded; Ayato’s at the limits of his endurance. Will they be able to prevail? After the Festa is over, Eishirou confronts the kidnapper and reveal’s the kidnapper’s name. How did Eishirou know? And why was the kidnapper so afraid of Eishirou? Flora tries to blame herself for all the trouble, but Julis comforts her — and Flora collapses sobbing in Julis’ arms. Julis and Ayato meet with Madiath Mesa, chairman of the Festa’s steering committee, who says he’ll try to help find Ayato’s sister. What we learn after Julis and Ayato leave could change the direction of the series. 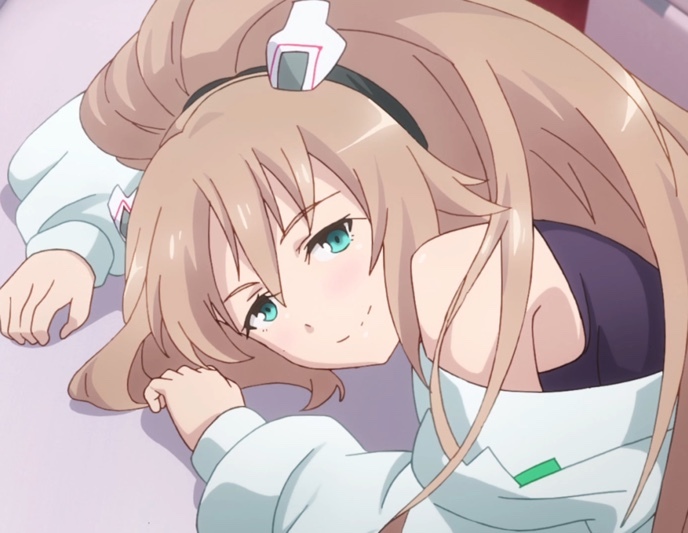 At the end of the previous episode, Claudia Enfield had told Julis and Ayato that the kidnapped Flora Klemm had been rescued. That meant Ayato could use Ser-Veresta. Now, he draws it and charges AR-D. The artificial life form parries each attack, which gave Julis a chance to strike. AR-D’s reaction surprises both of his opponents: he was able to block both attacks simultaneously. To do so, he releases so much energy that it drives Julis and Ayato back. Ernesta is not at all concerned at the amount of power AR-D released. Capture from the Crunchyroll stream. Camilla Pareto is furious at the release of power. She demands that Ernesta halt the match. Ernesta, though, smiles and says she has faith in AR-D’s opponents. While AR-D is trying to bring his power under control, Ayato and Julis have a moment to regroup. They realize that AR-D’s power source is either the Gravisheath (Irene Urzaiz’s that Ayato had broken to save her in a previous episode) or some other Ogre Lux. AR-D brings himself back under control as they finish their conversation. He, too, is surprised to find his true source of power. Delighted, he launches an attack. The resulting conflagration destroyed the arena’s first level of shielding and almost killed Julis. Fortunately, AR-D had damaged himself, so there was another short pause in the fighting. Julis reluctantly admits she can’t fight anymore. But she has an idea to help Ayato. She remembered Claudia saying that Ser-Veresta is capable of adapting itself to its wielder, but Ayato can’t fine tune his Prana to make that happen. In other words, he can only go flat out. So Julis tells him to pour his power into the sword, and she’ll handle the precision. Together, they’re able to reshape Ser-Veresta into a shorter yet no less powerful blade. Julis collapses to her knees and turns the rest of the match over to Ayato. AR-D finishes his repairs at the same time. Ayato and AR-D hurl themselves at each other and tear apart what was left of the arena. Ayato uses the debris as cover until he’s able to land the decisive blow that cleaves AR-D’s badge. At the awards’ presentation ceremony, the steering committee chairman, Madiath Mesa, presents the trophy to Ayato. When he holds it up for the crowd to see, they cheer. Under the city, in the sewers, Flora’s kidnapper tries to escape. Eishirou isn’t ready to let that happen, though. He surprises the kidnapper by knowing his name — Verner. For his part, Verner recognized Eishirou as a Shadow Star shinobi. After a very one-sided battle, Eishirou mourns the loss of a new jacket. Sasamiya Saya congratulates Ayato, only to be up-staged by Claudia grabbing Ayato’s arm. However, Ayato tells them that he couldn’t’ve have won without all of their support. He’s surprised to learn that even Lester MacPhail pitched in. Ayato thanks him, and Lester seems to do his best to be gracious. 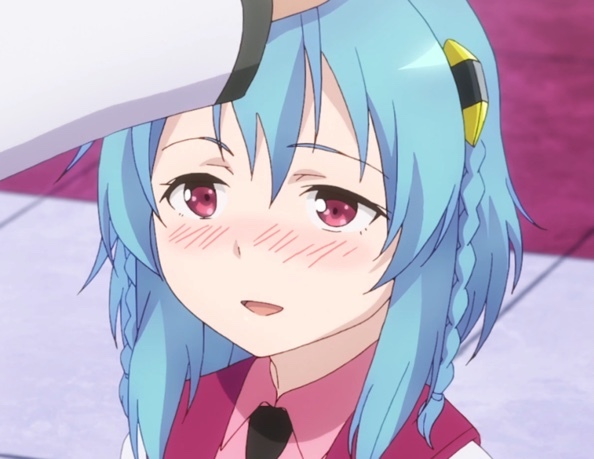 Saya was happy to receive Ayato’s well-earned head-pat. Capture from the Crunchyroll stream. Saya apologizes for not catching the kidnapper. Ayato says he’s just happy everyone got out all right, and he pats Saya’s head. Now, it’s her turn to up-stage Claudia! Camila and RM-C arrive, and Saya’s relieved that they are simply asking for a rematch. Camila says she didn’t know that Ernesta has used such unstable material for AR-D’s power source, and she thinks that Saya and Kirin’s performance merits a rematch. In particular, she says Saya’s dad’s weapon was superior to RM-C. Saya agrees. Ernesta talks to Dirk, who demands to know why she hadn’t answered his request that they join forces. She declines, but when Dirk reveals he knows about a third artificial life form she’s working on — something that even Camilla didn’t know — she says she’ll reconsider. Ayato and his entourage visit Kirin in the hospital. She’s recovering nicely from the wounds she received in the previous episode. Kirin gets a head-pat, too, for all of her help. Julis finally rejoins them, after having been questioned by the police about the kidnapping. She brought Flora with her, and the poor young girl was mortified at the trouble she feels like she caused everyone. Julis tries to put her at ease and tells her it’s okay to cry. She breaks down sobbing in Julis’ arms. Afterward, Julis asks Ayato to join her outside. She struggles to tell him how she’s feeling. She’s finally able to thank him, and he pledges to stay with her for the rest of the ride. After the end credits, Madiath tells Julis and Ayato that the police arrested members of a “mafia gang” who had abducted Flora. Julis protests, saying that Dirk was behind the plot, but Madiath confides that there’s no evidence. Speaking of evidence, Ayato’s asked for any regarding the fate of his sister. Madiath says he’ll do whatever he can. Julis feels frustrated at the lack of evidence against Dirk. Capture from the Crunchyroll stream. After they leave, Madiath takes a call from Dirk and takes the leader of Rewolf Black Institute to task for being too violent and stirring things up too much. Dirk asks if Madiath is going to tell Ayato about his relationship to “that woman” — Ayato’s sister. Saying it’s a private matter, Madiath cuts the connection. The last shot is of Amagiri Haruka, unconscious, in a fluid-filled medical device. Julis has driven a lot of their strategy, so it was nice to see her come up with the idea to reconfigure Ser-Veresta. Even though she was at the upper limits of her endurance, she didn’t want to give up. She’s been a strong figure through this whole series. AR-D laughed even when he lost the match. Seems he thoroughly enjoyed himself. I like his pure enjoyment of competition and his purity of spirit. A lot of humans could learn from that attitude! Ayato seemed surprised that the crowd cheered for him during the awards presentation. I think he’d been so focused on training and the other drama like Flora’s kidnapping that he’d forgotten that anyone might pull for him. That was an endearing moment. It’s nice to see such a powerful character show a little humility. Sylvia Lyyneheym winked at Ayato as he held the trophy aloft. It’s probably a good thing Julis wasn’t there to see it! Capture from the Crunchyroll stream. When Ayato held the trophy aloft for the crowd to see, Sylvia Lyyneheym was on the stage with the other VIPs. She winked at Ayato, and he blushed. He’s so not a player! I think Julis, Saya, and Kirin all find that trait very attractive in him. I wonder if it’s frustrating to Claudia? Lester almost acted like a tsundere when Ayato thanked him for his help. He seemed to make a genuine effort to respond, though, so maybe we’ll see him become more friendly in the future. Character development is a big plus! It was nice seeing Julis’ softer side when she consoled Flora. She sometimes lets that side show with Ayato, but it’s not often. As Julis struggles to put her thoughts into words, she accidentally causes Ayato to spill coffee on himself. He won’t let her use the handkerchief that the friends from the orphanage gave her. I like how he’s considerate to her. I’ve hesitated to say anything about this, because I get how plots need coincidences sometimes to advance, but each battle seems to have convenient stopping points for characters to plan or adjust their equipment. After awhile, it just seems too convenient. In this episode, it happened twice! Argh! I know the show said later that Julis was being questioned by police (regarding Flora’s kidnapping), but I thought it was unjust for her not to be at the awards ceremony. She and Ayato had earned that victory; it was a shame she couldn’t share in a little of the limelight. Outside of the battle scenes, the animation seemed a little less strong this time around. For example, at one point Claudia appeared to have Arnold Schwarzenegger’s legs (at the 17:00 point). In other scenes, she’s her usual slender self. 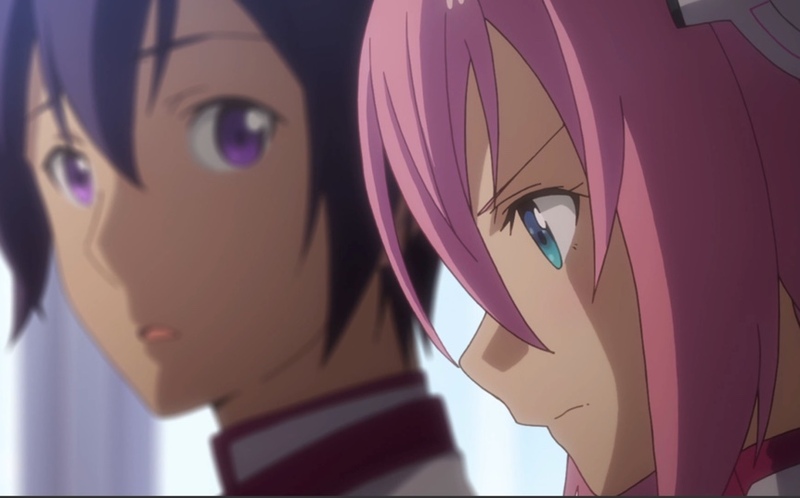 Some shots were on point, like the animation showing Julis’ frustration at the lack of evidence against Dirk. Overall, though, it just didn’t feel up to par. Why does Madiath have Haruka in a big jar? Capture from the Crunchyroll stream. To be honest, I’m glad the Festa’s over. The fighting scenes were well-animated and fun to watch, but as I said under “What I Liked Less,” I got tired of the too-convenient pauses. Did Madiath smile affectionately when he looked at Haruka’s unconscious form in the medical device? Lustfully? Is he treating her/keeping her alive to help her — or is he imprisoning her? Is he keeping her as a plaything? Can’t say I approve of that! Looking back at the first episode, it seems clear to me that Madiath was the one fighting against Haruka in the match that ended so badly for her. So what’s his deal? What’s their relationship? If he’s really concerned for Haruka, why not tell Ayato? And why plot with Dirk? There aren’t many episodes left in this season. I haven’t seen any announcement of a third season. I wonder if they’ll try to wrap up these story threads in the remaining few episodes? thank you for this. I watched the 21st episode but i couldn’t figure out why Madiath has Ayato’s sister’s body. Per your comment about the first episode, i went back and watched the first ep again and i agree with you…the hair color is the same and the two men look the same height. You also brought up a whole new set of questions in my head lol now i’m really looking forward to the remaining episodes. I have a lot of the same questions as you do, I bet! I’m looking forward to the remaining episodes as well. Now, if I can only get the next review written!